A couple months ago, I wrote that Apple is missing an opportunity by not offering Mac users a “netbook”—a scaled-down, bare-bones laptop computer generally optimized for e-mail and Web browsing. Recently I’ve been playing with an Eee PC from Asus to get a feel for what the netbook experience is really like. Asus is one of the leading purveyors of netbooks. 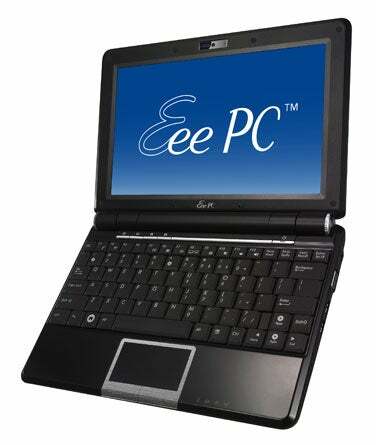 It revolutionized the market when it introduced the Eee PC line, which starts at only $300—less than one-third the price of Apple’s least-expensive MacBook. You can buy these in big box retail stores like Target and Toys R Us. And in case you’re curious, Asus pronounces the system just “e.” Not “Eeeeeeeee.” Eee stands for “easy to learn, easy to work, easy to play,” according to Asus. The model I have—the 1000HA—is a bit larger and more robust than that basic system, which eschews a hard drive for a tiny solid-state drive and uses a 7-inch display. My system comes equipped with a 10-inch LCD panel and a 160GB hard disk drive. It’s powered by an Intel Atom N270 microprocessor clocked at 1.6GHz, along with 1GB of RAM. With a retail price of $429.99, this is a mini-laptop that’s very easy on the pocketbook, with robust enough specifications that it’s suitable for a wide variety of tasks. The Eee 1000HA weighs in at 3.2 pounds (1.45 kg) with its battery in place and measures 10.47-by-7.5-by-1.5 inches (266-by-191.2-by-38mm) at its thickest point. Compare that to a MacBook Air—12.8-by-8.94-by-0.76 inches, with the lid closed and a weight of about 3 pounds—and you’ll get a clear understanding of what a tremendous engineering feat the MacBook Air really is. Having said that, the Eee isn’t appreciably heavier or that much bulkier with the lid closed than a MacBook Air is, at a fraction of the price. My tiny Eee PC. 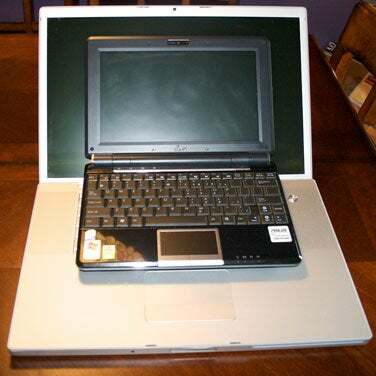 To provide you with some idea of scale, that’s a 17-inch MacBook Pro the netbook is sitting on top of. My first impression—and one that’s endured—is that the 1000HA is small. Smaller, in fact, than any laptop I’ve ever owned. I’ve constantly had a Mac laptop ever since my PowerBook 540c, and for the past several years I’ve had a string of 17-inch PowerBooks and MacBook Pros. I’ve grown accustomed to a full-sized keyboard and a gradual spread, with lots of screen real estate and—with the introduction of Spaces in Leopard—as much “virtual” screen real estate as I can comfortably manage. So it was complete culture shock to suddenly find myself with a laptop computer with a downsized keyboard (Asus claims it’s about 92 percent the size of a “full” laptop keyboard, but it definitely is markedly smaller than what I’m used to) and overall dimensions so small that I have trouble balancing it on my lap without having it fall through my legs. The keyboard does have nubs on the home row keys, which makes touch-typing possible. The unusual and somewhat cramped keyboard layout (cursor keys jammed into an area to the left of the right shift key) took me about a day to get used to. That Asus makes 4G and 2G models even smaller than this is a bit disturbing: I find the 1000HA right at the limit of usefulness for me, and I wear a medium-sized men’s glove, so my hands and fingers are by no means oversized. The backlit TFT display is bright and clear. With a native resolution of 1,024-by-600, it’s a widescreen format, but it’s “shorter” than what you may be accustomed to, and this can take some transition when you’re surfing Web pages or reading mail and have to scroll all the time to read more than a few lines of text. Powered by Intel GMA integrated graphics, the 1000HA is certainly no graphics powerhouse—I wouldn’t expect to run After Effects or games on this—but that’s not the system’s intent. Something called “Dolby Sound Room” is also built into this system; it provides spatialized audio to produce simulated 3-D sound effects. The operating system running on the Eee PC is likely to be the biggest Achilles’ Heel for any Mac user considering this system: It’s Microsoft Windows XP. Some Eee systems offer Linux as an option, and you can easily reconfigure this Eee with Linux if you prefer. But at this point in its life cycle, XP is relatively stable and certainly effective, and it provides users with the widest possible selection of software they want, so it’s hard to quibble with Asus’ choice. I fully admit, however, that I spent most of the first evening of my Eee use updating the tiny netbook with the complete list of security updates and usability patches Microsoft mandates, including Windows XP Service Pack 3 (SP3). Asus does include a suite of software to help you get started, including Microsoft Works, e-mail and even online storage hosted by Asus (up to 10GB for free, with a 5GB daily download cap, free for the first 18 months). Skype is included, which works well with the integrated 1.3-megapixel Web cam, positioned in the same spot you’d find an iSight camera on an Apple portable (centered on the top bevel of the display). Setting up the Eee to be a good companion to my Mac systems proved to be trivially easy. I simply downloaded Apple’s MobileMe control panel for Windows, which enabled me to synchronize my address book contacts and calendar information to the Eee. I also configured the Windows Mail client to connect to my MobileMe e-mail account via IMAP, so all of my mail settings are the same between systems. As a tried and true Mac user, I’ll tell you frankly that I don’t like Windows nearly as much as I like Mac OS X, but I was able to find adequate replacements for just about all the applications that I depend on with my Mac quickly and easily, and was able to use most of what Asus provided, as well. What’s missing here from the “full” experience Mac users get is an absence of an integrated suite of applications that offer the same depth and breadth of creative experience as Apple’s iLife apps do. Microsoft Works is a competent, albeit uninspired, suite of productivity apps, and a few other apps included with the system help to close the gap somewhat. Then again, multimedia capabilities are not this little machine’s strengths, so a direct Apple-to-Asus comparison isn’t really appropriate. And compared to Dells and other PCs I’ve used, Asus is pretty good about not including a slew of shovelware applications or advertising that gunks up the average mass-market consumer PC hard drive like the Las Vegas strip on a Saturday night. The system is instantly useable as soon as it boots from the hard drive. The Eee 1000HA sports built-in 802.11g Wi-Fi networking, and it was able to spot my home network (as well as any Wi-Fi hotspot I ran into) without any trouble whatsoever. It also comes equipped with an Ethernet RJ-45 connection, VGA jack for plugging in an external monitor and three USB 2.0 ports to connect additional peripherals (two on one side, one on the other), like an external keyboard and mouse, hard drive or DVD drive, or non-networkable printer. The 1000HA also has a Secure Digital (SD) card slot on the right hand side, so if you’re working with an SD-equipped device like a digital camera or camcorder, you can plug in the storage card and transfer files over immediately. The Eee is reasonably quiet, though I was able to hear fan noise and hard drive spinning noise in a quiet room. It has built-in stereo speakers, along with a headphone jack and microphone jack. Asus says that you should be able to wring about seven hours out of the built-in battery. I saw nowhere near that—closer to five hours, running various application software, doing some light word processing, and accessing the Web and e-mail (including watching a few YouTube videos—yes, Adobe Flash works just fine). Asus includes power management tools to help you tweak the system’s settings depending on your needs. At $429, the Asus Eee 1000HA is much more in the realm of affordability than any of Apple’s current laptop offerings, at least for the average user. The MacBook Air, by comparison, is a paragon of style and sleekness, but it’s priced four times as much in its base configuration. When the MacBook Air came out, I likened it to a BMW Z4 roadster—a fun weekender, something scaled to meet a different need than the utility of a “daily driver.” Yet the MacBook Air remains a general-purpose laptop that works well for most tasks, now more than ever, with its refreshed Nvidia 9400m-based design. The Asus 1000HA takes this “second car” route in a radically different direction. Rather than focusing on style and sleekness, Asus has built a tiny laptop that provides a remarkably good user experience provided your expectations are reasonable. The Eee 1000HA is no replacement for a full-sized laptop or a desktop computer, but as a means to check e-mail and get some light work done while you’re out and about, it’s fantastic. The Eee 1000HA gets you around town conveniently and economically—Asus’ answer to the Smart Car Fortwo. Back to my original thesis: Now, more than ever, after spending some time with an Asus Eee, I remain convinced that Apple is missing an important opportunity by sitting on the bench rather than entering the netbook market, and I hope Steve Jobs and company bring something to market soon (as the rumor mill suggests they might. I’d love to see something in the form-factor of an Eee PC that’s descended from the DNA of the iPhone. That’d be the best of all possible worlds, and it would certainly give Asus, HP and the other companies that have carved out a niche in this market a new target to aim for.